This large fan is hand-painted and hand-crafted in Kyoto by the renowned artist Tomokazu Kurashima. It is painted on both sides with striking natural images relecting the changing seasons. 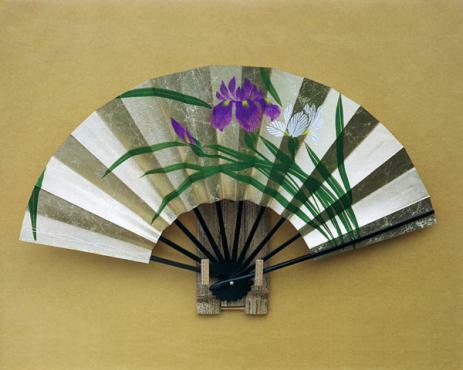 This fan carries the design of an apricot blossom on one side, an iris on the other. This large fan is hand-painted and hand-crafted in Kyoto by the renowned artist Tomokazu Kurashima. It is painted on both sides with striking natural images relecting the changing seasons. This fan carries the design of an apricot blossom on one side, an iris on the other. With several essentially Japanese elements, this fan is classic in every sense of the word.